Question: Why did Match Fit Academy FC apply for Players First licensing? Chris Leahy, Executive Director of Match Fit Academy FC: We, at Match Fit Academy FC, applied for Players First licensing, as we are firm believers that true player development involves the continued education and progression of player, parent and coaches alike. 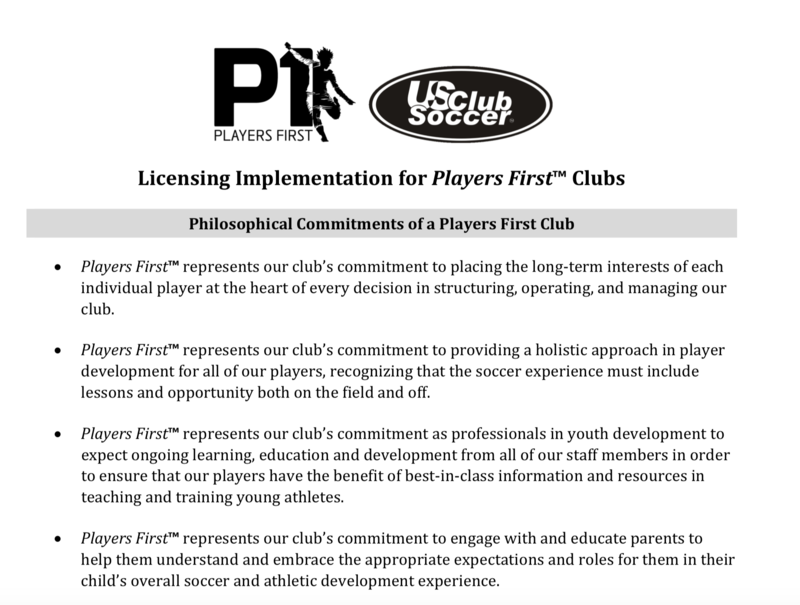 We feel the Player First licensing program will further aid our ability to provide developmental and educational opportunities to all members of our club. Question: What does it mean for Match Fit Academy FC to now be an official Players First-licensed club? Leahy: We are extremely honored to be an official Players First-licensed club. We feel US Club Soccer continues to offer a platform for clubs to operate in the best interest of our member base. Each club, each market, each level has its own demands across the country, and we feel being a Players First-licensed club now allows us to offer programming for our players, parents and coaches to ensure we are meeting those demands. Additionally, we are proud to be associated with other like-minded clubs across the country on this initial 46-member list. We look forward to collaborating with them and sharing new ideas and best practices. Leahy: Players First licensing is truly a unique platform, as it incorporates all members within your club. While players are our main focus, the sport in this country does have parent involvement, and we feel it is important to help educate parents as well in the developmental process. The initiatives for our staff coaches will be extremely beneficial, as well. In today’s market where coach education is becoming very expensive and not inclusive, the Players First platform will broaden our opportunities for our staff to continue their development as well. Question: What would you like the parents of Match Fit Academy FC to know about what this means to them? Leahy: We, at Match Fit Academy FC – while being in various leagues and platforms in our going-on 19 years – feel we have always stayed true to catering our structure and programming to our member base. The Players First licensing will allow us to maintain this philosophy, while expanding upon not only the education and developmental processes for our players, parents and coaches, but also extend our networking with other like-minded clubs under US Club Soccer’s vision. Immediately gain important recognition in the respective marketplaces. Special offerings, benefits and discounts from Players First partners. Distinguished as Players First-licensed in member club directory. Increased exposure through US Club Soccer’s best-in-class search engine optimization. Features on US Club Soccer’s Players First web page (logo, link, date of license). Highlights in US Club Soccer emails and digital and social media. Receive customized content from US Club Soccer (social media toolkit and promotional graphics). Features through external media outreach by US Club Soccer (plus ensuing media coverage). Access to use Players First logo for club promotion. "Philosophical Commitments of a Players First Club" (available in the PDF below) placement on club website.